I was recently lamenting the fact that I haven't done much blogable crafting lately. 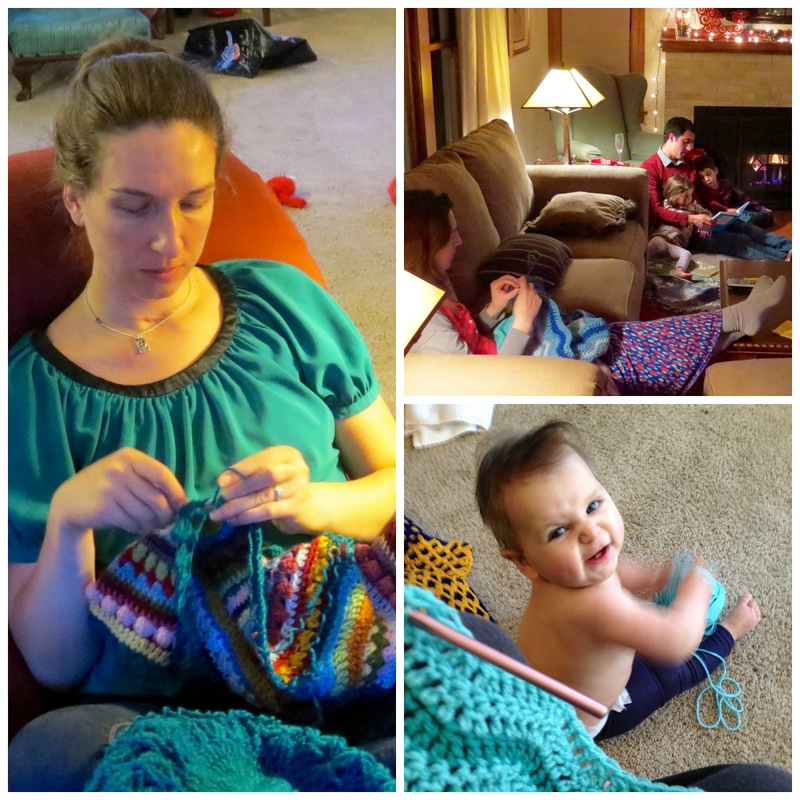 Then, looking through pictures, I kept scrolling past crochet projects or pictures of me crocheting. I really have been crafting! 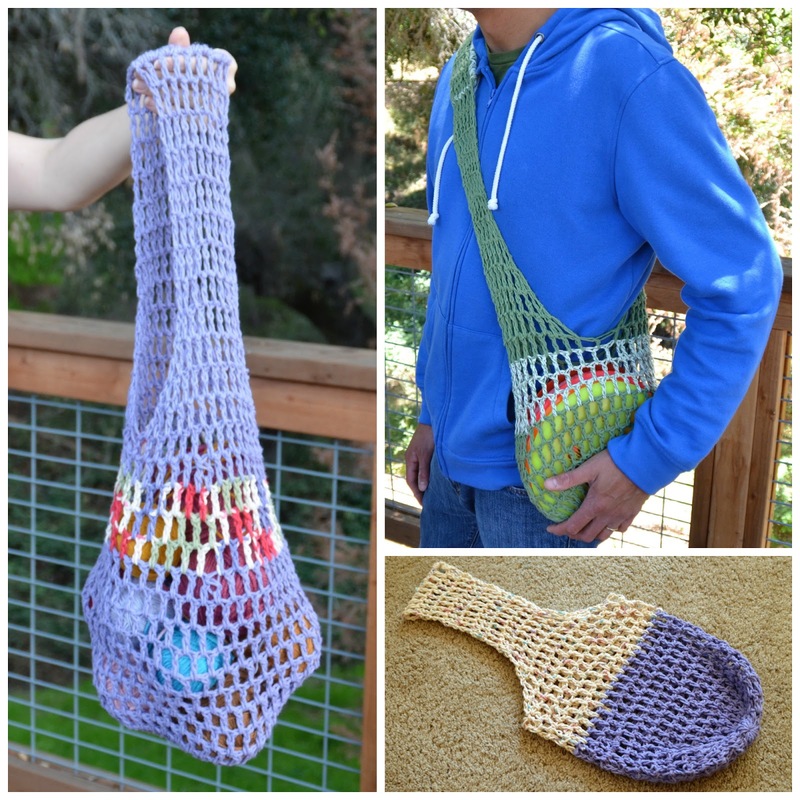 It's just not especially original work, run-of-the-mill type crochet stuff. I still consider myself a beginner. There's so much to learn. But I decided it would still be fun to show off what I've been working on. 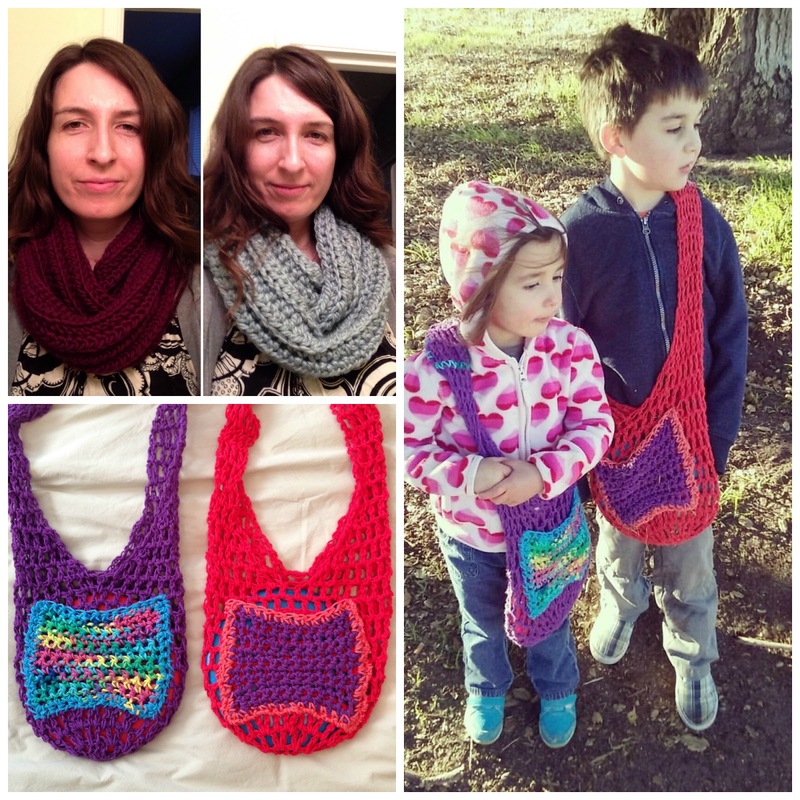 I'll post links to the patterns, videos, and tutorials where applicable. Crocheting while heavily pregnant with Roz, holiday crocheting and family time, and Roz trying to get in on the action. Blankets! Top left and bottom right are ripple patterns memorized after watching many different videos. 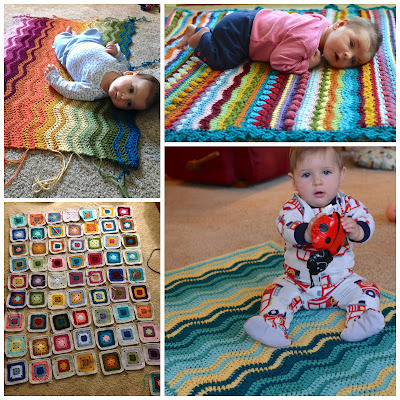 Top right is a fun miscellaneous striped blanket I made along with this video. The edge is wonky, but I'm proud of my first blanket. The bottom left is squares for an afghan I'll finish someday. Solid squares using triple crochet stitches. Market bags! These were my crafty gift for Christmas last year. I made at least eleven for gifts at the time and have made a few more since. I already blogged about them (here) and did my best to write directions. What a fun project! I'm wondering as I type who I can make one for. Maybe Everett's teacher needs a market bag as an end-of-the-year gift--filled with wine and massages. I didn't crochet nearly as many gifts for Christmas this year. I made infinity scarves for my mother in law and sister in law. I think this is the pattern I used. And I made disc golf bags for the kids using the modified market bag pattern I used for their dad's disc bag. And some other little projects. 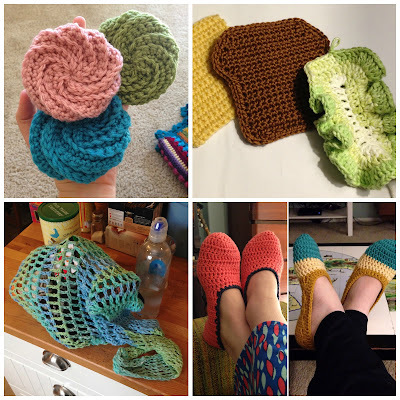 I made many of these dish scrubbies to give as gifts along with the market bags last Christmas. They were beautiful and striped in all sorts of colors, but recently Brian asked me to make a few for our dish scrubbing needs. They are much more plain for our kitchen. But it's so nice to be asked to make something that someone needs. Here is the pattern. I experimented with making some play food. Cheese, bread, and lettuce. No patterns, just trial and error. That's all I have so far. Pretty pathetic sandwich. But I'm excited to make more! I made some little slippers. This is the video I watched. I have size 10 feet, so I had to make them larger in every way--length, height on the sides, and depth of toe. And I added a picture of the market bag I made for my mom. She brought it over, and it was fun to see something I made being used. I had to snap a picture. Excuse me. I need to get back to crocheting. 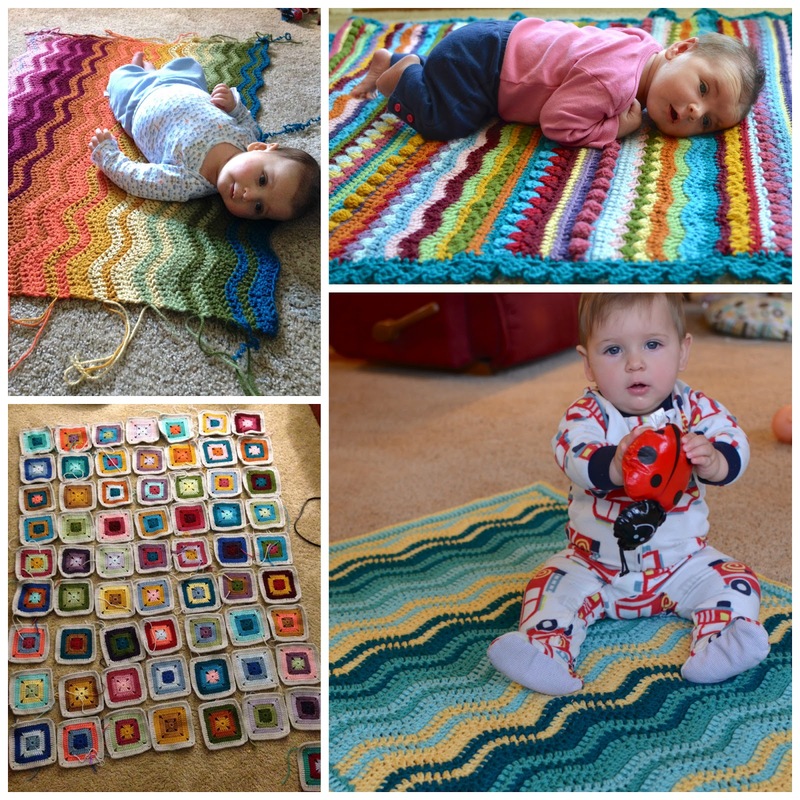 My rainbow ripple blanket is almost done. Maybe . . .